SAERTEX LEO COATED FABRIC has the highest level of fire resistance integrated in the fabric and meets the most stringent fire protection requirements for rail transportation, the marine sector and the construction industry. It is optimally suited for manufacturing simple or curved structural parts, and is processed using the vacuum infusion technique. 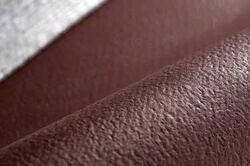 SAERTEX LEO COATED FABRIC complies with the strictest fire safety standards and railway applications HL3 acc. to EN 45545-2 (-3) and can be used in floor panels of rail vehicles. The product SAERcore LEO also meets the HL3 fire protection requirements in accordance with the EN 45545-2 standard, which has been the binding standard in the rail vehicle sector since 2018. It is the solution for design parts with complex shapes which are also subjected to low mechanical stresses. SAERcore LEO is processed in RTM and RTM light procedure. All of the materials meet the most exacting demands – you are on the safe side with the SAERTEX LEO range.